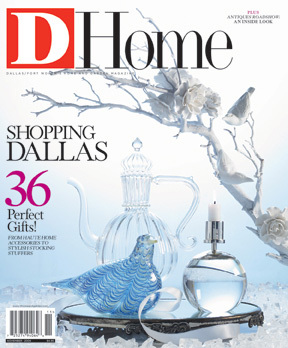 By D Magazine | 10 years ago The D Home editors make a list—and check it twice—of gifts so fabulous that you’ll want to keep them for yourself. By Allison Hatfield | 10 years ago Lisa and Anthony Palmer moved from the UK to UP. In short order, they hired interior design whiz James McInroe to turn their spec house into a stylish home. By D Magazine | 10 years ago When Antiques RoadShow came to Dallas last summer, photographer Dave Shafer was thereâ€”antique camera in hand. Canâ€™t catch the show when it airs January 26? No problem. Shafer brings the action to you. By Laura Kostelny | 10 years ago Discerning clients count on Barry Williams for his refined and elegant taste. So it only makes sense that the noted interior designer brings that sensibility home at the end of the day. By Peggy Levinson | 10 years ago Outdoor furniture options just got a whole lot brighter. Make every hour happy with these 5 o’clock finds. By Amanda Tackett | 10 years ago During these days of Thanksgiving, I give thanks that the Dream House—and more specifically my possessed kitchen appliances—haven’t killed me. Yet. By Kristie Ramirez | 10 years ago Owner of Again & Again and Again & Again Modern + traveler + music lover + 7-Eleven aficionada. By D Magazine | 10 years ago When Antiques RoadShow came to Dallas last summer, photographer Dave Shafer was there - antique camera in hand. Can’t catch the show when it airs January 26? No problem. Shafer brings the action to you.